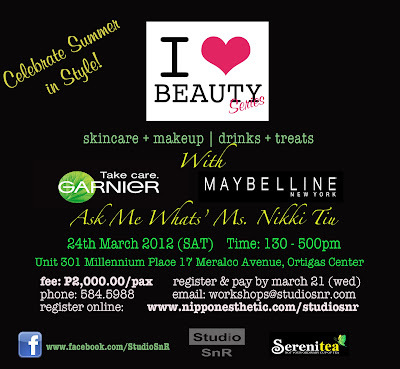 Studio SnR's I Heart Beauty Series with Garnier, Maybelline and AMW! Studio SnR Lifestyle Workshop, after series of successful workshops, is now coming up with another wonderful series called "I Heart Beauty"! As the title suggested, this is meant for YOU who are into anything beauty related! And of course, COUNT ME IN! I HEART BEAUTY TOO!!! Learn simple makeup tips and tricks from Maybelline's Makeup Team headed by Archie Tolentino, Jim Ros and Harold Santos. I will be there to share my knowledge and experiences on skincare and I will also talk about some makeup products base on my years of product testing and my experiences as a makeup artist. Oh, it would be great to meet AMW readers too!!! Php1,500 worth of products (and more) beauty loot. Tools will be provided for day's use, but feel free to bring your own tools. Interested? I hope you are! Book and pay by March 21, 2012 to avail a special gift! Limited slots available by the way! Let me know if you're going! I can't wait to meet you! Thanks for including me in such a wonderful workshop! Super excited!!! 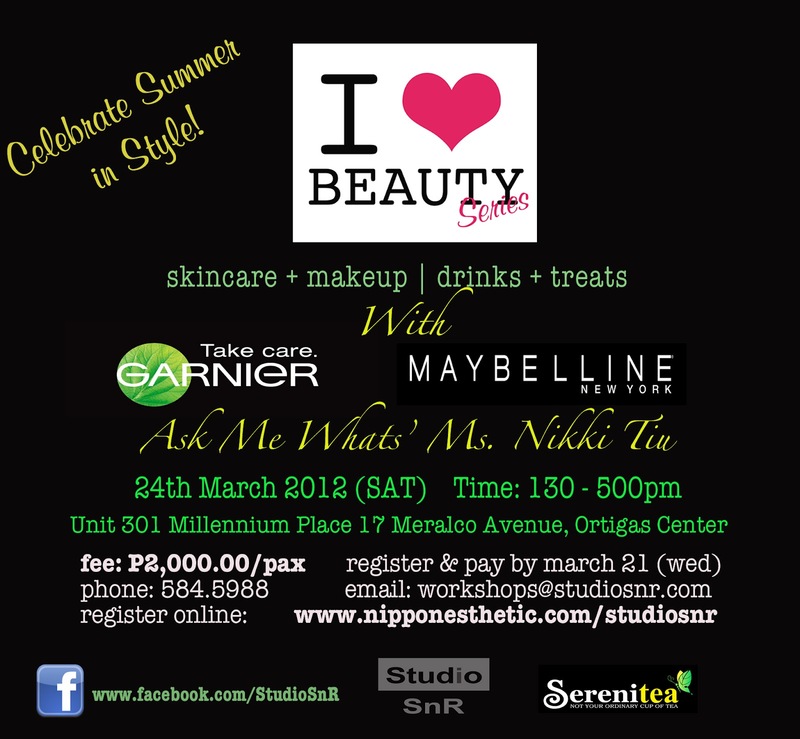 this is a great treat ms. nikki... i would love to join.and get a chance to see you in person. just a question though, are there any makeup tools to bring? Hi there, thanks for your query! I confirmed with Studio SnR that tools will be provided for day's use but you can feel free to bring your own brush set since you are comfortable with it! :) Are you joining? Can't wait to meet you!